Mobile GPS Driving Directions in India by Nokia Drive (Nokia Lumia) | Free Pc to Phone Calls, Free Voip Calls to India International ! If you have recently started driving, or shifted to a new city or may be visiting a new city then there is high chance that you will get lost in the city roads. Specially Delhi! However if you have a direction assistant with you, then it will be very easy to drive on the roads. Global Positioning System (GPS) is very popular in countries like USA, Canada, Europe, but it ain't popular in India. Most cars here in India do not have any GPS facility and if you want GPS then you need to buy a device. Most smartphones today already have GPS device inbuilt. So you can use your mobile phone to get driving directions and that too free. I tried it on my Android Mobile but it didn't work (Google Maps Directions don't seem to work). However when I tried this on Nokia Lumia (Windows Mobile) it worked too good. 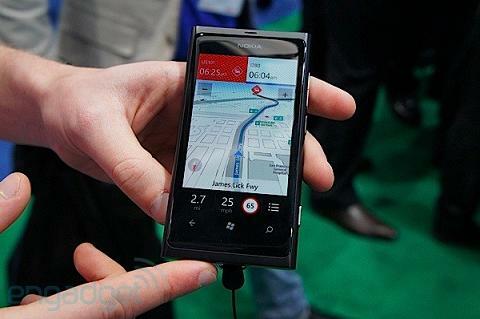 Nokia Lumia mobile phones, which are windows based comes with a inbuilt application named Nokia Drive. This application makes use of GPS and gives you exact road direction. I have tried it on Delhi Roads and it gives me exact directions (even the sector roads). Before we go into detail about how to use Nokia Drive for GPS driving on Indian roads, lets first discuss some of its features. This application in in build in your Lumia Phones. Makes use of GPS on your Phone. You need to download the map of the city (once). Once you have map downloaded, it does not require internet. You can select the voice type (male/female) from which you want to get directions. Highly accurate : whenever there is any turn it will let you know 50-100mts before. Another excellent feature : You can track your location, speed, and the distance driven, even if not navigating. You will see your current location. To drive and get directions offline (save data plan) : Go to settings and switch connections to offline. Open the app, go to Settings. In the settings tab, select Manage Maps. Click on + (add sign). Select a continent, a country, and an area if applicable, then select Install. To cancel the download, select X. Select > Set destination , then search for your destination or select a recent destination from Last destinations. Select DRIVE TO > START . Please note that when you use Nokia Drive for the first time, your phone asks you if you want to download street maps for your current location and a navigation voice that matches your phone language settings. If you download the maps using your home Wi-Fi connection before you leave for your trip, you will save on data costs while traveling. All your articles are out-dated as usual.. Who said Android doesnt support GPS. My god.. have u ever about an app called Sygic? Dude.. may I know how is this article out dated ? This post is about using GPS for getting directions.. Why don't you post some stats about how many Indian android (or smartphones) users actually use GPS for getting driving directions.. I have nowhere said that android users are dumb.. I just said that "I tried on android mobile" and google maps don't give proper directions. I am in no mood to compare android Vs Nokia now (I am using all iOS/Android/Windows)... As far as Sygic is concerned.. I am sure you are aware that its a paid application.. (only few days trial). Also there may be more similar apps on android as well (free and paid), but as of now no in build application (already there when I buy a new samsung/htc/sony.. smartphone) provides this feature (offline driving directions using GPS).